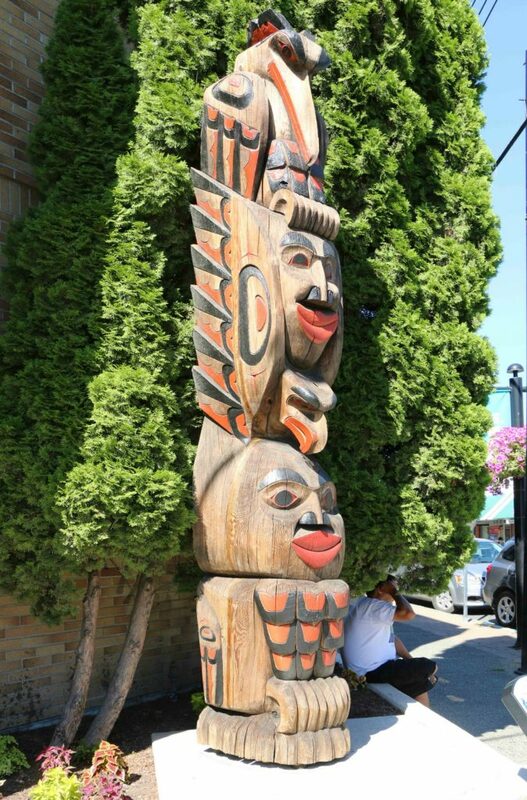 One of the popular attractions in downtown Duncan is the City of Duncan’s Totem Pole collection, displayed throughout the downtown core and in selected locations outside the downtown core. 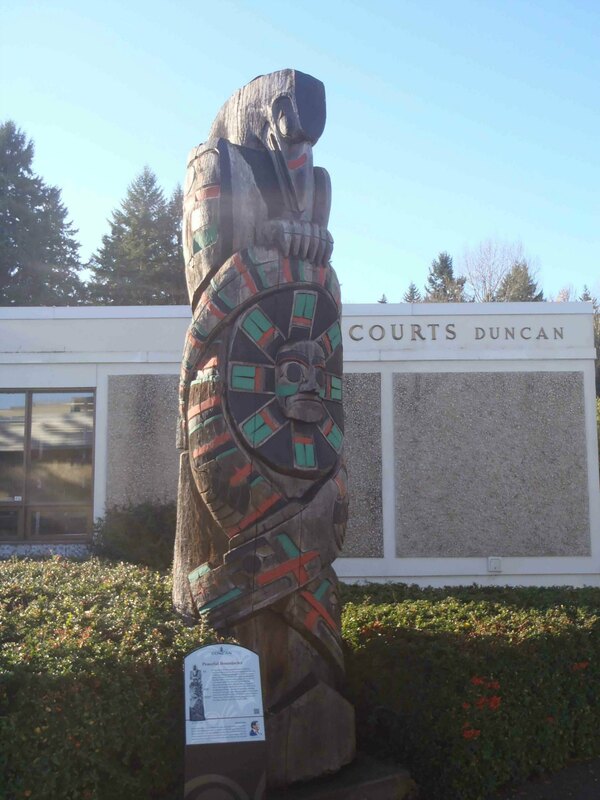 We have included two separate tours of the downtown Duncan Totem Poles. This tour, Tour 1, is the way we typically do it. Tour 2 is the route laid out by the City of Duncan, which you can do by following the yellow feet painted on the sidewalks. Your choice. 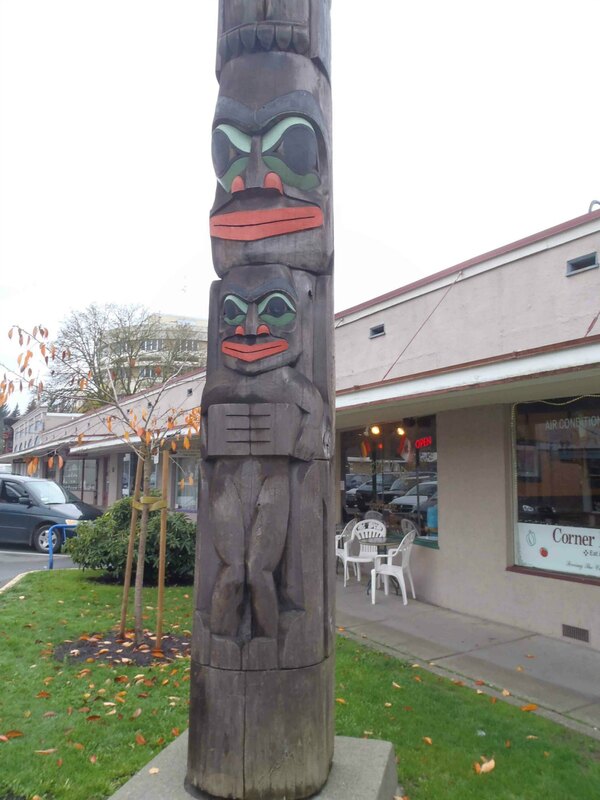 The City of Duncan’s totem pole display in downtown Duncan can be easily and comfortably seen on foot. It is displayed within a three block area bordered by Kenneth Street and Station Street on the north and south and Canada Avenue and Government Street on the east and west. 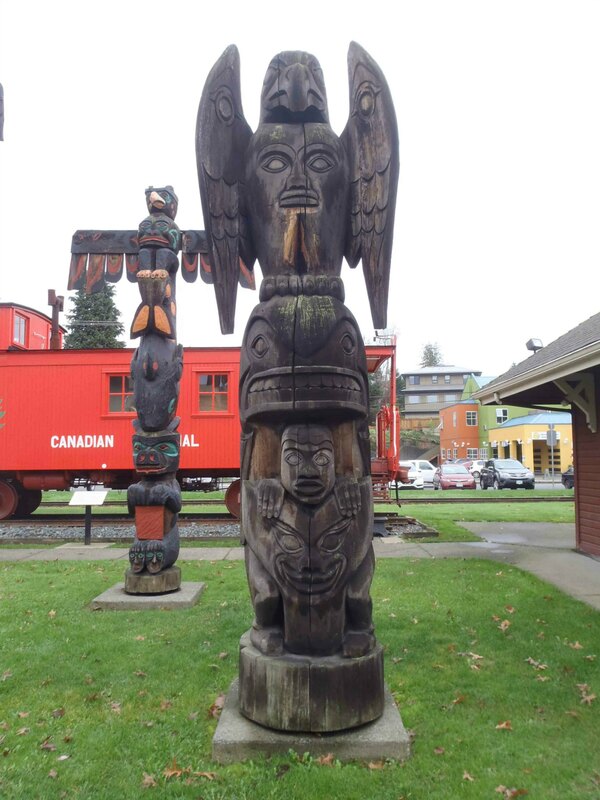 The Cowichan Valley Museum in the former E&N Railway Station offers a free guided tour of the downtown Duncan totem poles. If you’d like a guided tour, ask about it at the Cowichan Valley Museum front desk. 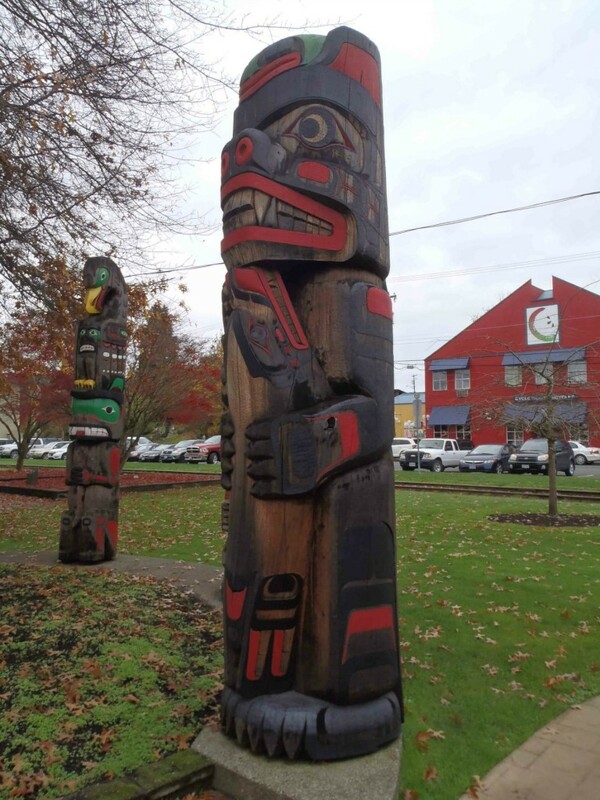 If you’d like to explore Duncan’s downtown totem pole collection by yourself, here is one of our our suggested walking tours of the totem poles in downtown Duncan. Here is a digital map of the downtown totem poles, which we have also included on its own separate page so you can keep it open in a separate window while your doing the walking tour. We suggest starting in Charles Hoey Park at the intersection of Canada Avenue and Station Street. Start at the Centennial Pole, in Charles Hoey Park on Canada Avenue at Station Street. Centennial Pole, Charles Hoey Park, Canada Avenue, Duncan, B.C. 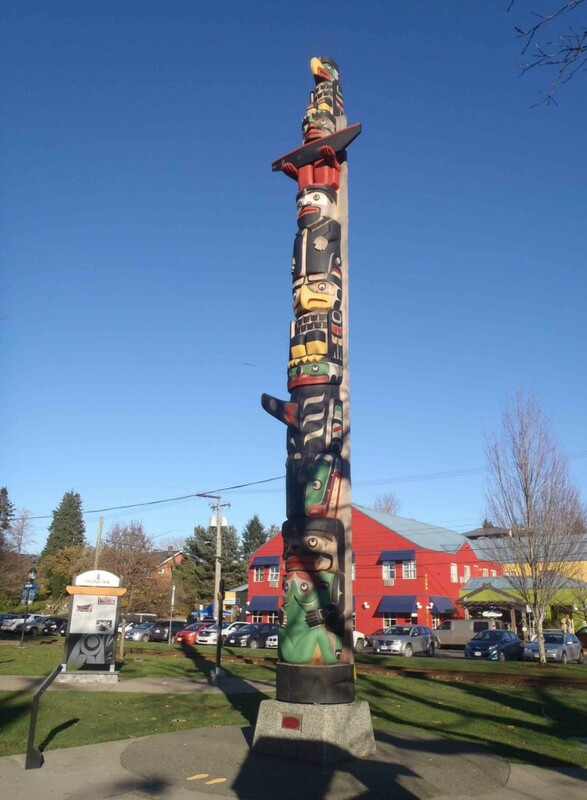 The Centennial Pole was carved and erected in 2012, making it the most recent pole in the City of Duncan’s collection. It stands 10.4 m (34′) in height and is displayed in Charles Hoey Park near the intersection of Canada Avenue and Station Street in downtown Duncan. The Centennial Pole was carved by Calvin Hunt. It was commissioned in honour of the 100th anniversary, or Centennial, of the City of Duncan, which was incorporated in 1912. 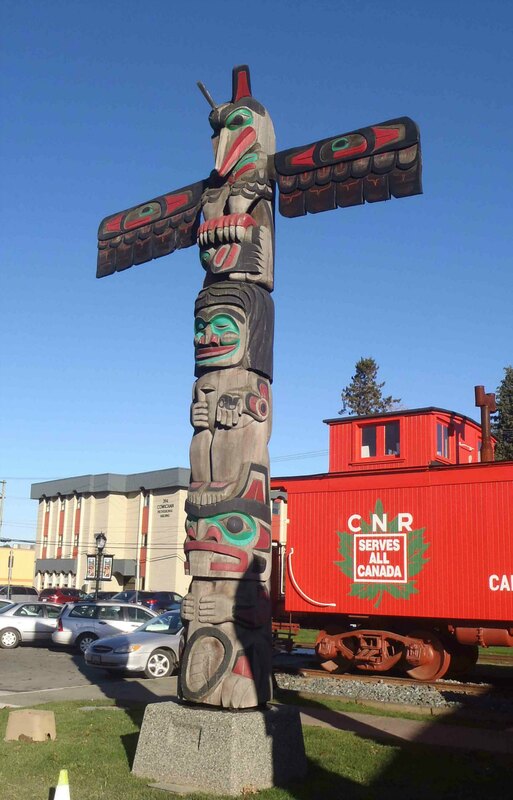 Read More…..
A few steps north of the Centennial Pole, near the former E&N Railway Station, is a display of four totem poles: Kwagu’l Bear Holding A Seal, Owl Pole, Friendship Pole and Transformation In Life. Kwagu’l Bear Holding A Seal, Charles Hoey Park, Canada Avenue, Duncan, B.C. The Kwagu’l Bear Holding A Seal was carved in 1987 by Richard Hunt, the uncle of Calvin Hunt, carver of the Centennial Pole. It depicts three figures: the Frog, the Kwagu’l Bear and the Seal. It stands 3.6m (11’9″) in height and is displayed in Charles Hoey Park, on Canada Avenue, near the Station Street intersection and the E&N Railway Station. Read More…. Owl Pole, Charles Hoey Park, Canada Avenue, Duncan, B.C. The Owl Pole was carved in 1987 by Francis Horne, Sr. It stands 3.7m (12′) in height and is displayed in Charles Hoey Park on Canada Avenue near the Station Street intersection and the E&N Railway Station. Read More…. Friendship Pole, Charles Hoey Park, Duncan, B.C. Transformation In Life totem pole, Charles Hoey Park, Canada Avenue, Duncan, B.C. 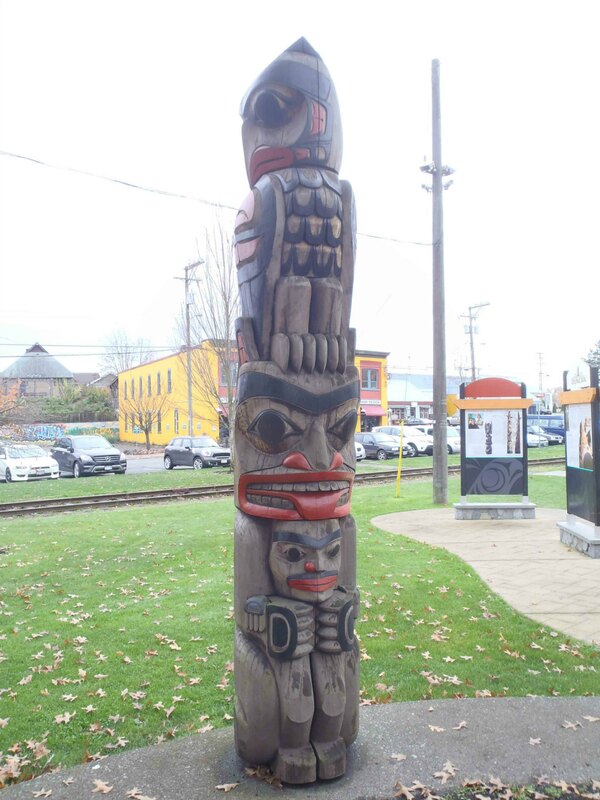 Next to the display of Kwagu’l Bear Holding A Seal, Owl Pole, Friendship Pole and Transformation In Life, you’ll see the former E&N Railway Station, now home to the Cowichan Valley Museum. 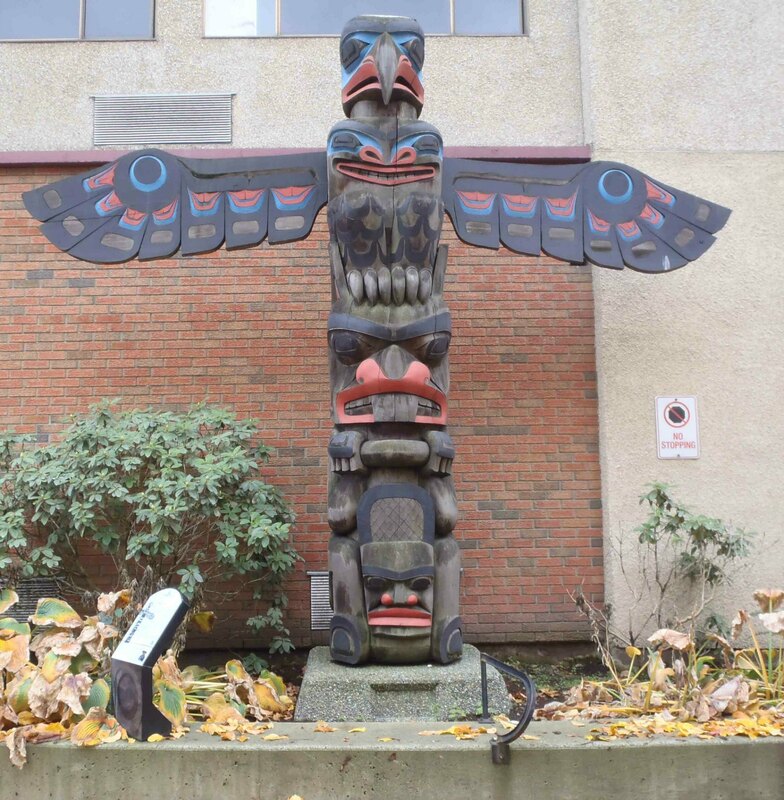 If you go north on Canada Avenue to the other end of the E&N Railway Station building, you’ll find another display of four totem poles: Pole of Wealth, Raven’s Gift, Transformation and The Feast. We suggest leaving those for the end of the tour. The former Esquimalt & Nanaimo (E&N) Railway Station, now the Cowichan Valley Museum, Canada Avenue, Duncan, B.C. From the former E&N Railway Station, continue the Totem Pole Walking Tour from the south side of the E&N Railway Station building by crossing Canada Avenue at Station Street (there’s a pedestrian crosswalk there). 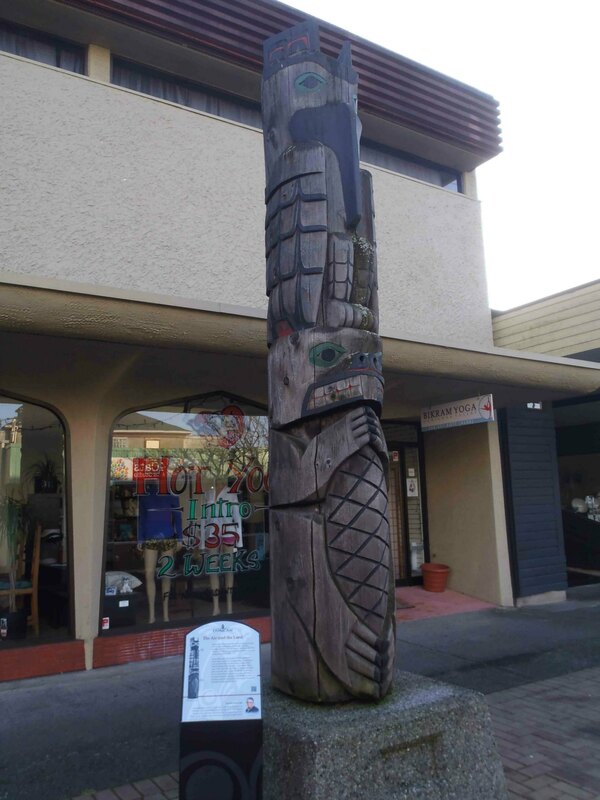 Now continue the Totem Pole Walking Tour by going west on Station Street. 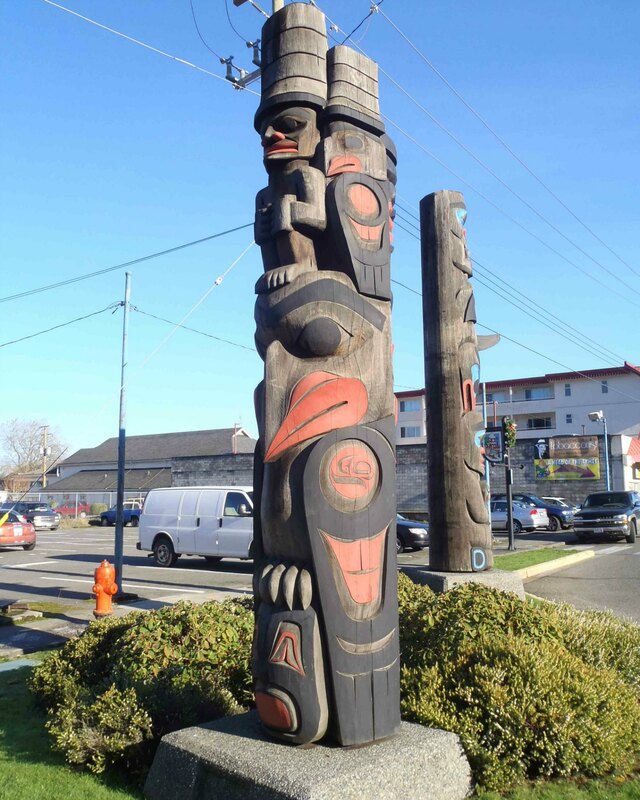 At the south west corner of the intersection of Canada Avenue and Station Street, the Raven Stealing the Sun totem pole is usually displayed. Raven Stealing The Sun was placed back on public display in July 2016 after having been removed from public display for several months while undergoing maintenance. Walk west on Station Street to the Judy Hill Gallery at 22 Station Street. Outside the Judy Hill Gallery at 22 Station Street is Bringing Light To The World. Bringing Light To The World totem pole, Station Street, Duncan, B.C. 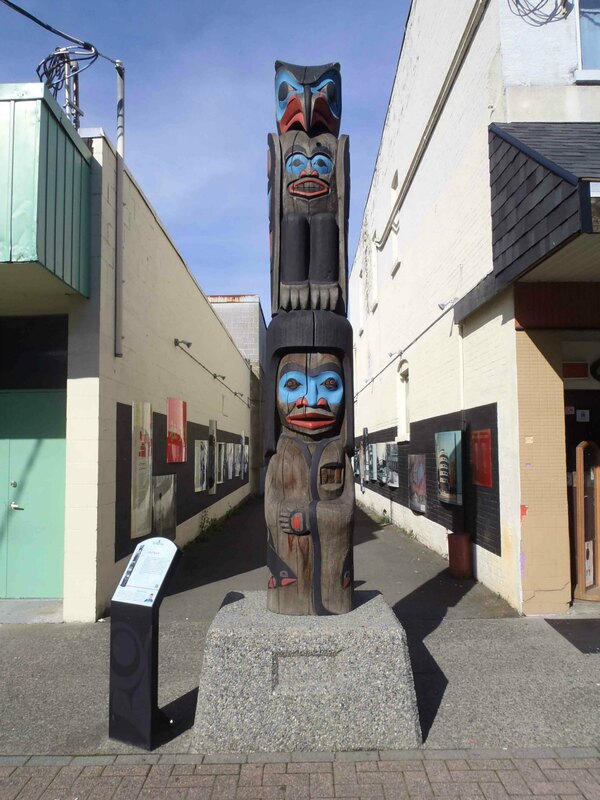 There are two more totem poles in this block of Station Street between Canada Avenue and Craig Street: Wind Spirit and Transition. They are on opposite sides of Station Street and there is a pedestrian crosswalk across Station Street between them. 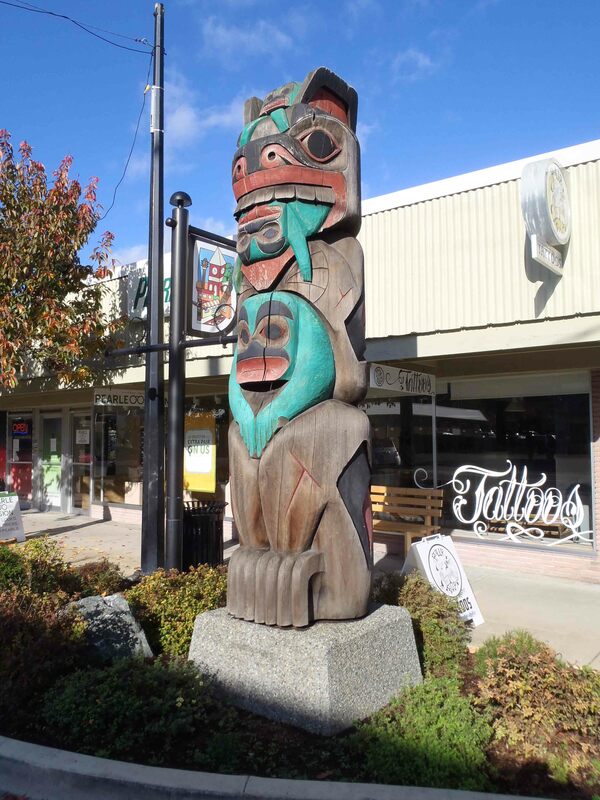 Wind Spirit totem pole, Station Street, Duncan, B.C. Transition totem pole, Station Street, Duncan, B.C. Continue west on Station Street for half a block until you come to the intersection of Craig Street and Station Street. 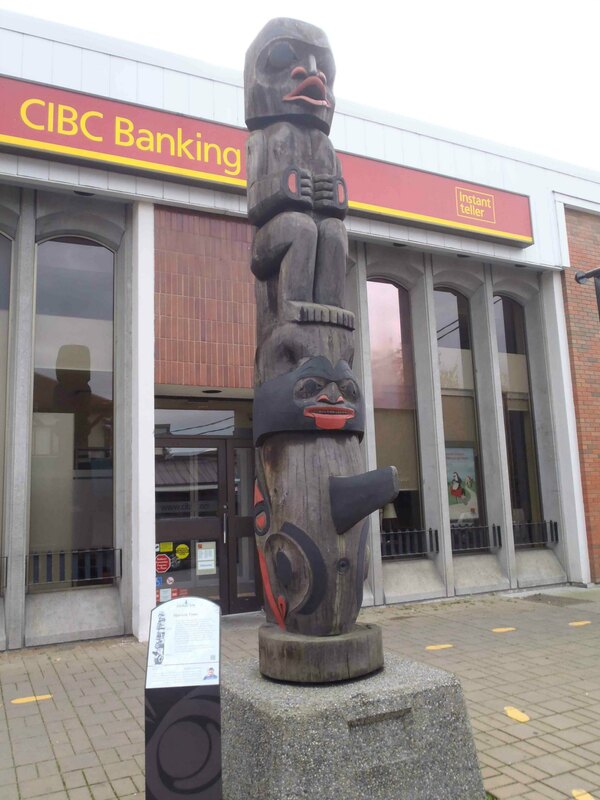 There are three more totem poles at this intersection: Thunderbird With Dzunuk’wa and Scudder Pole are in a small park at the north east corner of the Station Street and Craig Street intersection; Harvest Time is displayed on the south west corner in front of the CIBC bank. Thunderbird With Dzunuk’wa totem pole, Station Street at Craig Street, Duncan, B.C. 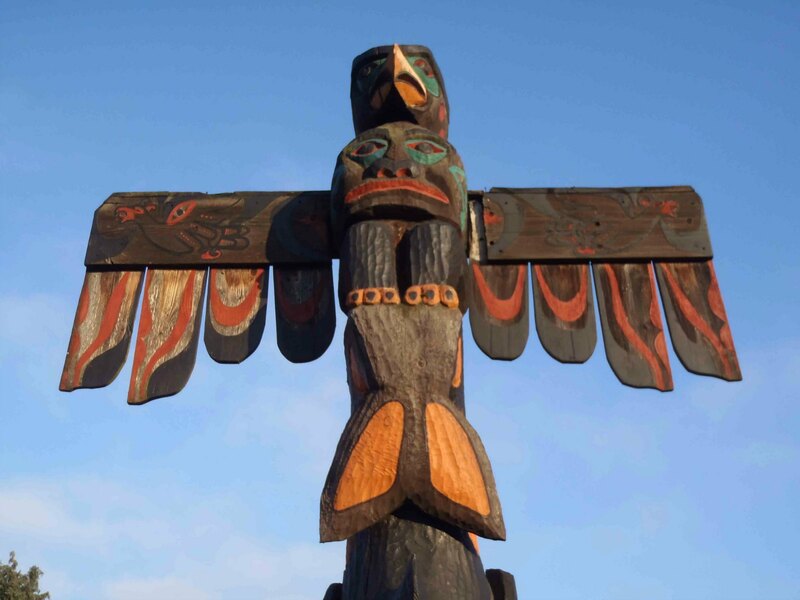 The Thunderbird With Dzunuk’wa totem pole was carved in 1990 by Ned Matilpi….Read More…. Harvest Time totem pole, Station Street and Craig Street, Duncan, B.C. Harvest Time was carved in 1986 by Tom Lafortune…..Read More…. Continue west on Station Street from Craig Street for half a block and you will find two more totem poles: Air and the Land and Owl Spirit. Air and the Land was carved in 1986 by Harold Joe….Read More…. Directly across Station Street from Air and the Land you’ll find Owl Spirit. While you’re at Owl Spirit, you might also want to check out the historical exhibit on Duncan’s former Chinatown, on display in the lane directly behind Owl Spirit. Duncan’s former Chinatown (demolished in 1970) stood where the Provincial Courthouse stands now. You’ll be going there shortly to see four totem poles on Government Street. Continue west on Station Street toward Government Street. Just before the Government Street intersection you’ll find the Abolishment Pole. Abolishment_Pole, Station Street, Duncan, B.C. 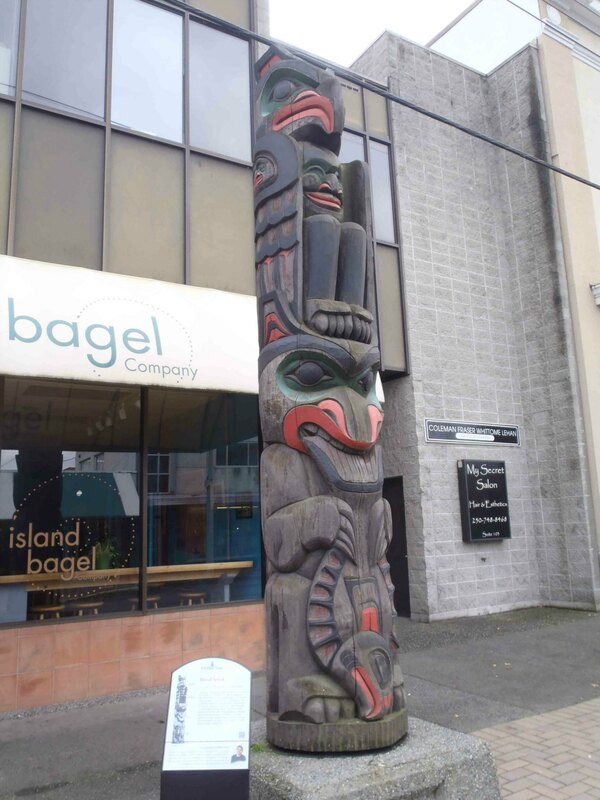 The Abolishment Pole was carved in 1990 by Donald Smith….Read More…. Continue west on Station Street to the intersection of Government Street. There are several totem poles displayed here but the first one you will encounter is Sea and Sky. At the intersection of Station Street and Government Street, you’ll find Sea and Sky. 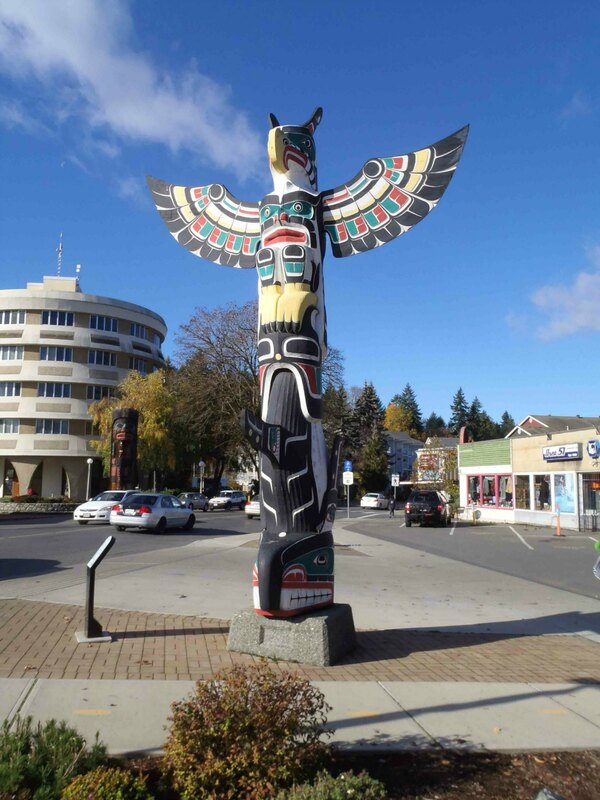 Cross Government Street (there’s a pedestrian crosswalk at Government Street and Station Street near Joe’s Tire Hospital) and you’ll find a collection of four totem poles: Eagle Raven Bear, Cedar Man Walking Out of the Log, Gwa’yasdams Flood Story and Peaceful Boundaries. Eagle Raven Bear is usually displayed on Government Street at Station Street, outside the Valley Seniors Center. It is currently undergoing restoration and has been removed from public display. Cedar Man Walking Out of the Log, totem pole, Government Street near Jubilee Street, Duncan, B.C. Cedar Man Walking Out Of The Log was carved in 1988 by Richard Hunt. The tree it was carved from was over 750 years old and was donated by forestry company MacMillan-Bloedel…Read More…. 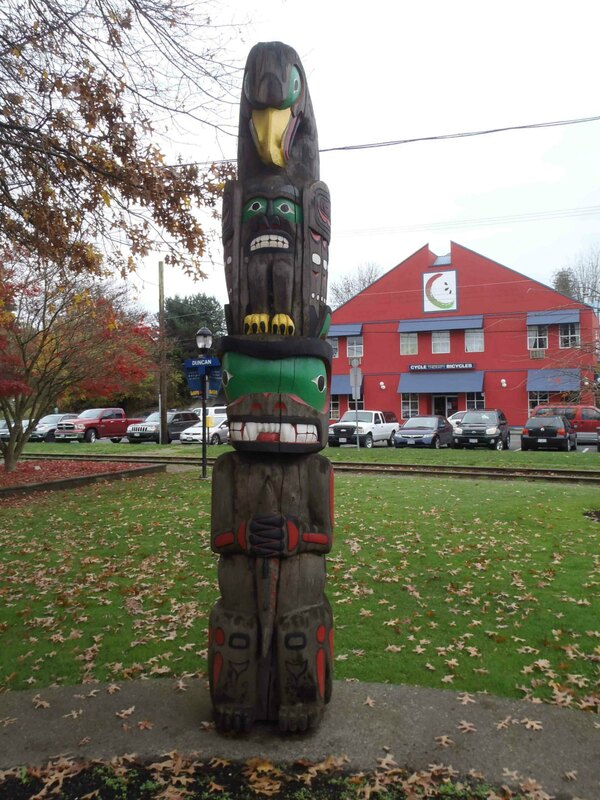 Gwa’yasdams Flood Story totem pole, Government Street near Station Street, Duncan, B.C. Gwa’yasdams Flood Story was carved in 1988 by Basil James….Read More…. Peaceful Boundaries is displayed outside the Provincial Courthouse on Government Street….Read More…. Walk one block along Government Street to E.J. Hughes Place and you’ll find a display of three totem poles: Cedar Woman and Man, Pole of Wealth and Transformation of Man. Cedar Woman and Man, Pole of Wealth, Transformation of Man. Cedar Woman and Man, totem pole, Duncan, B.C. Cross Government Street (there are pedestrian crosswalks at Jubilee Street and Boundary Street), turn left and continue to the intersection of Government Street and Kenneth Street, where you’ll find a display of three totem poles: The Guardians, Chief’s Pole and Dzunuk’wa. 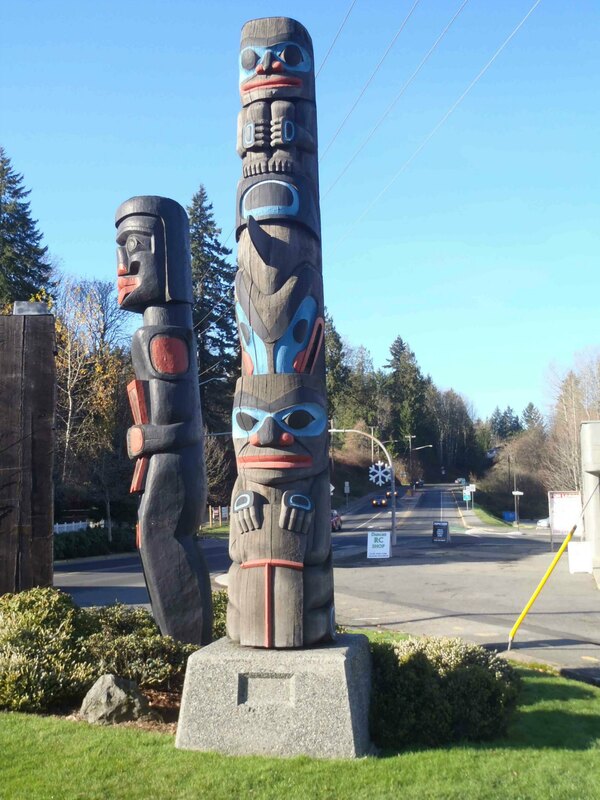 Chief’s Pole, Government Street at Kenneth Street, Duncan, B.C. 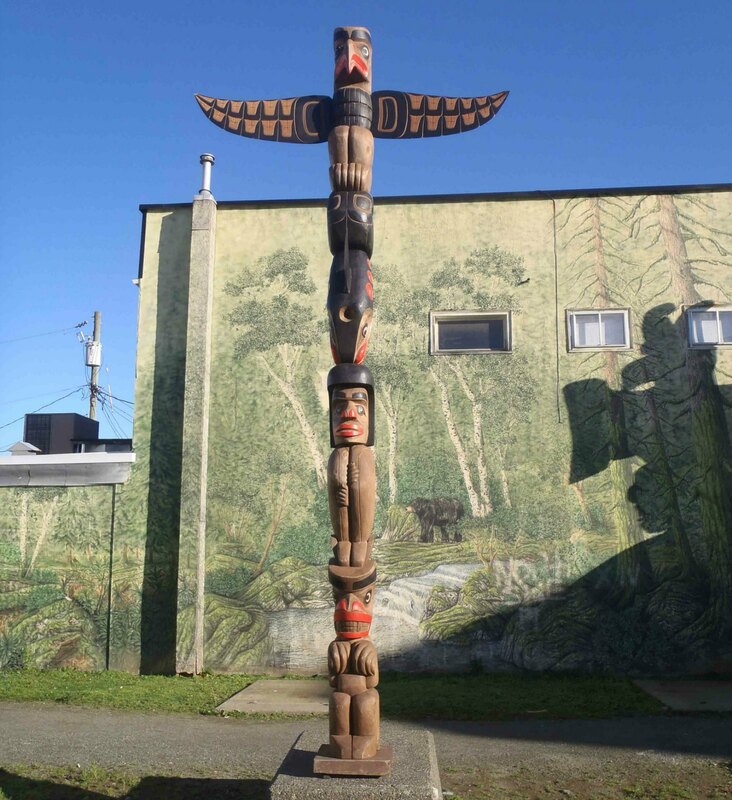 Dzunuk’wa pole, Government Street at Kenneth Street, Duncan, B.C. 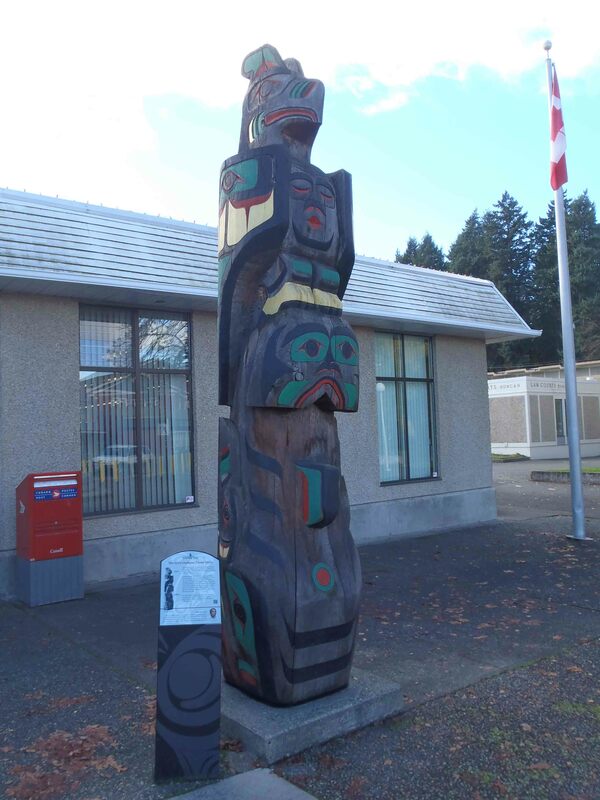 The Guardians pole, Government Street at Kenneth Street, Duncan, B.C. Now we’ll turn east on Kenneth Street, and head back toward Canada Avenue. 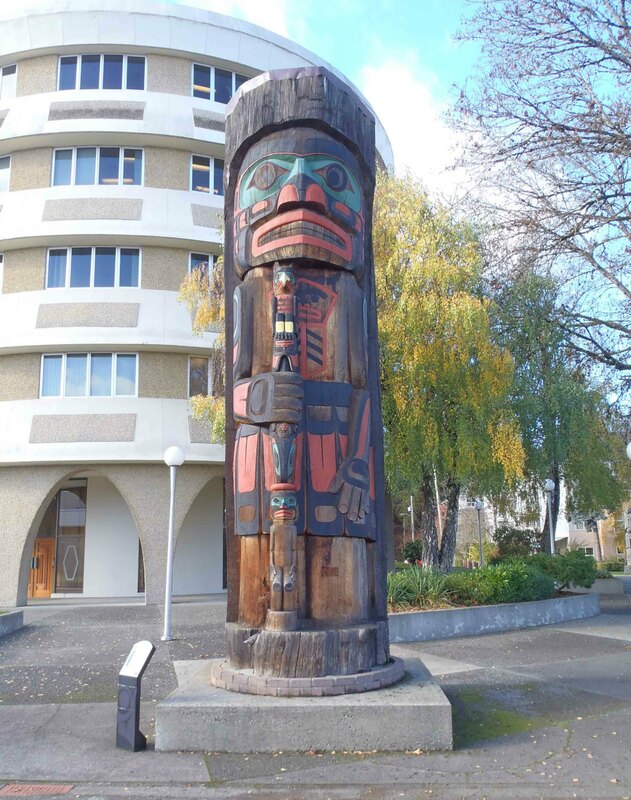 At the intersection of Kenneth Street and Jubilee Street, you will find The Family totem pole. 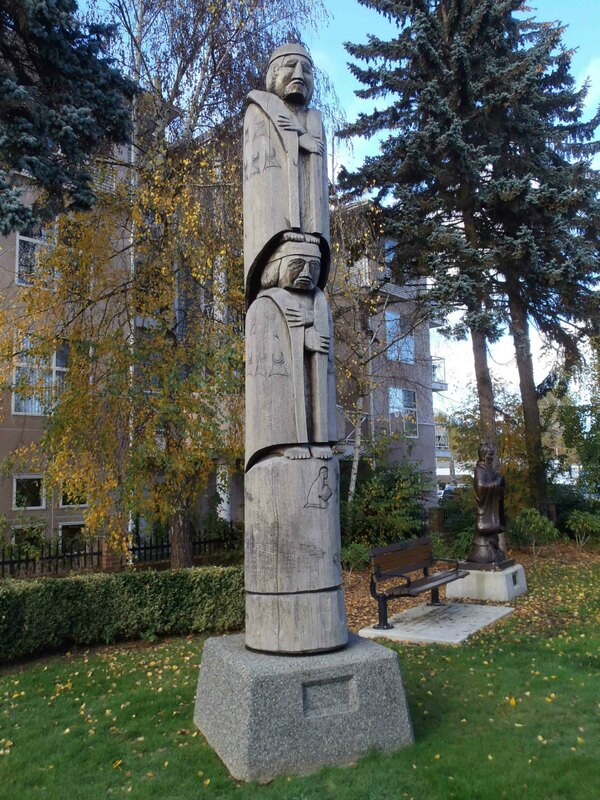 The Family, totem pole, Kenneth Street at Jubilee Street, Duncan, B.C. 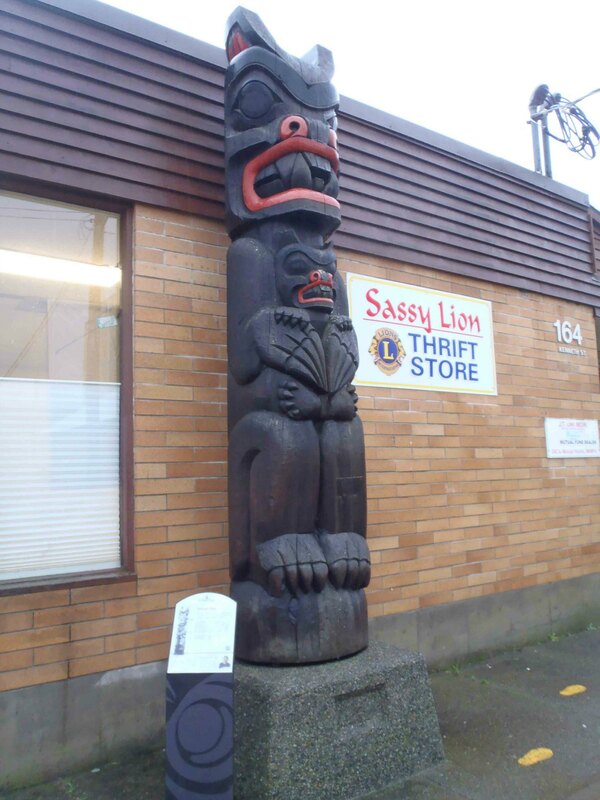 Continue half a block east on Kenneth Street and you’ll find the Family Pole outside the Sassy Lion Thrift Store at 164 Kenneth Street. 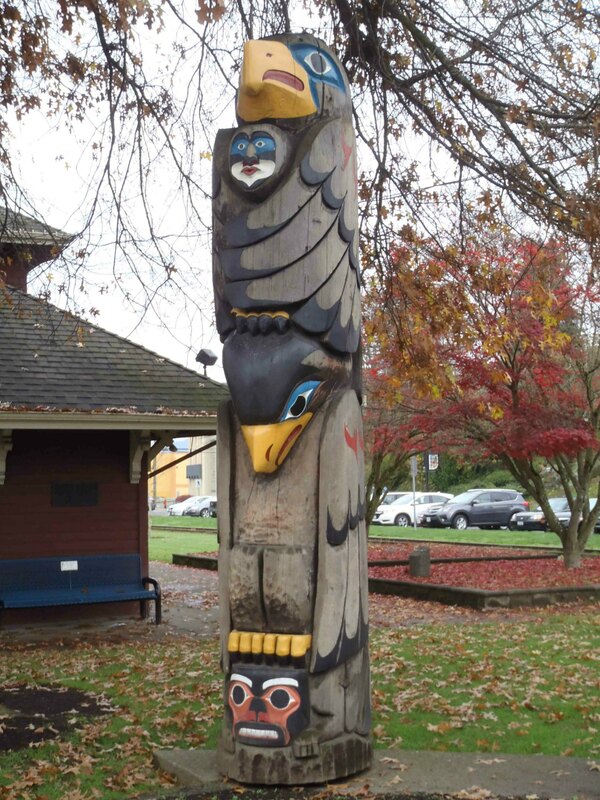 Family Pole was carved on 1986 by Doug LaFortune….Read More…. 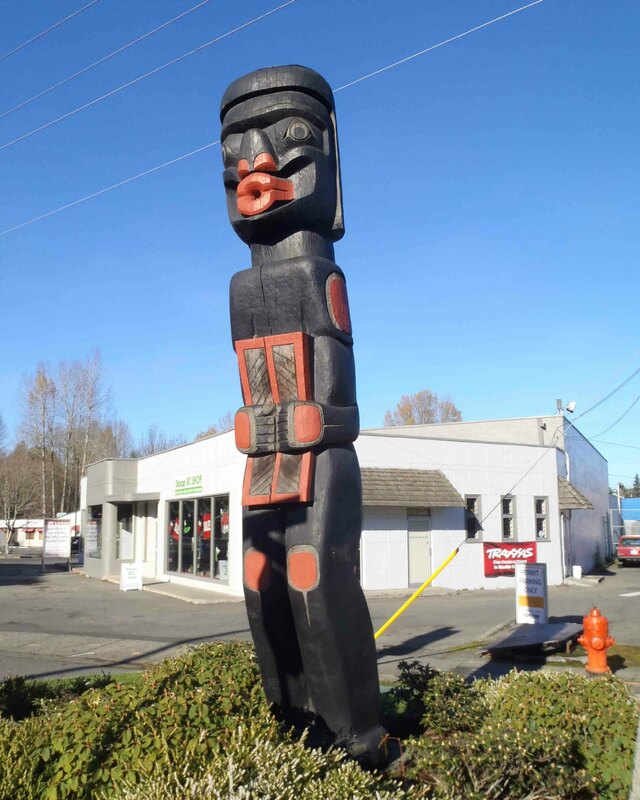 Leaving Family Pole, you’ll find Tzinquaw Story a short walk east on Kenneth Street. 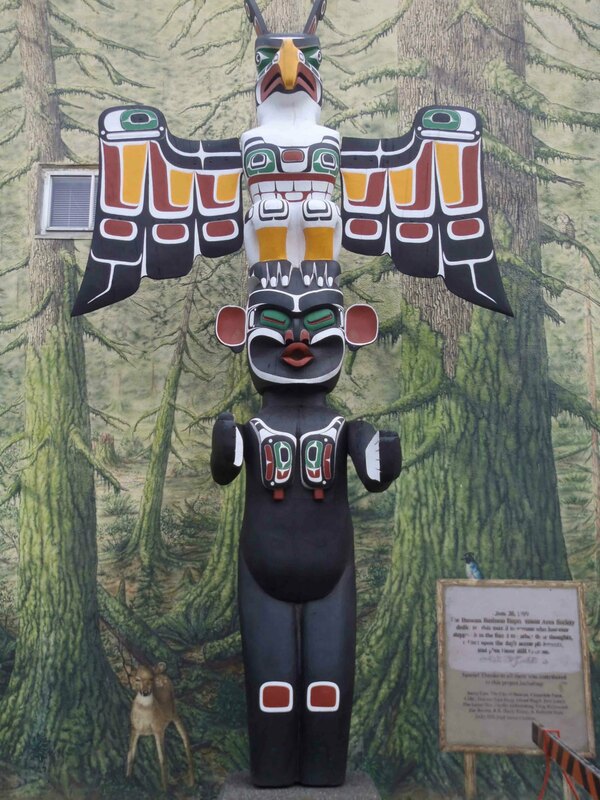 Tzinquaw Story totem pole, Kenneth Street, Duncan, B.C. 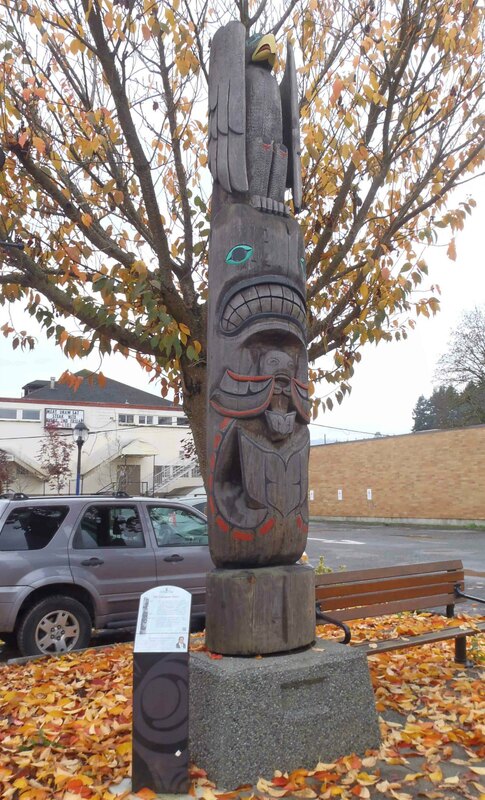 Tzinquaw Story was carved in 1986 by Harvey Alphonse, a hereditary Chief of Cowichan Tribes…..Read More…. Leaving Tzinquaw Story and continuing east on Kenneth Street, you’ll see the Duncan City Hall at Craig Street. Inside Duncan City Hall, a Simon Charlie pole called Mortuary Pole is on display. 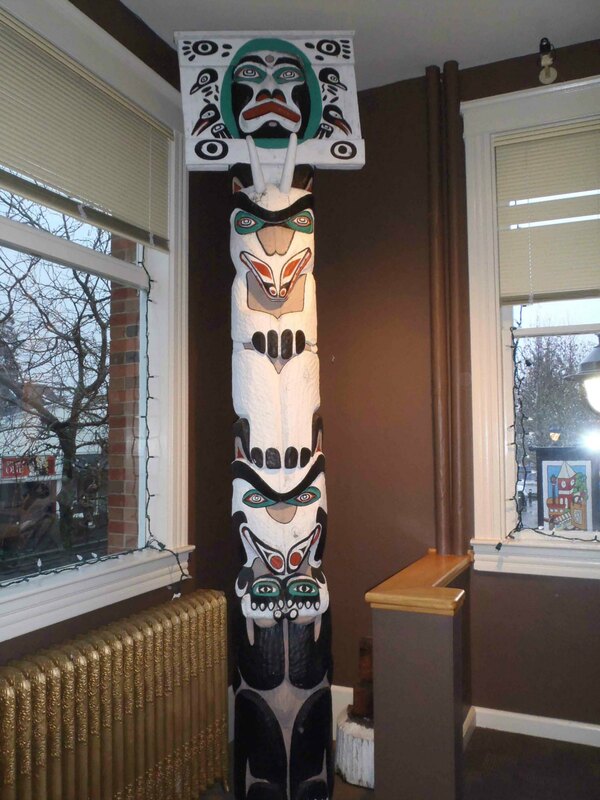 Mortuary Pole was carved by Simon Charlie and was donated by the Cowichan Valley Museum. It is displayed in Duncan City Hall and is only available for viewing during regular City Hall hours…..Read More…. Turn left on Craig Street and walk north on Craig Street for half a block into City Square to the Mother and Child sculpture in front of the Adelborg Building, which contains Studio One at 161 Craig Street and Saltspring Soap Works at 169 Craig Street. 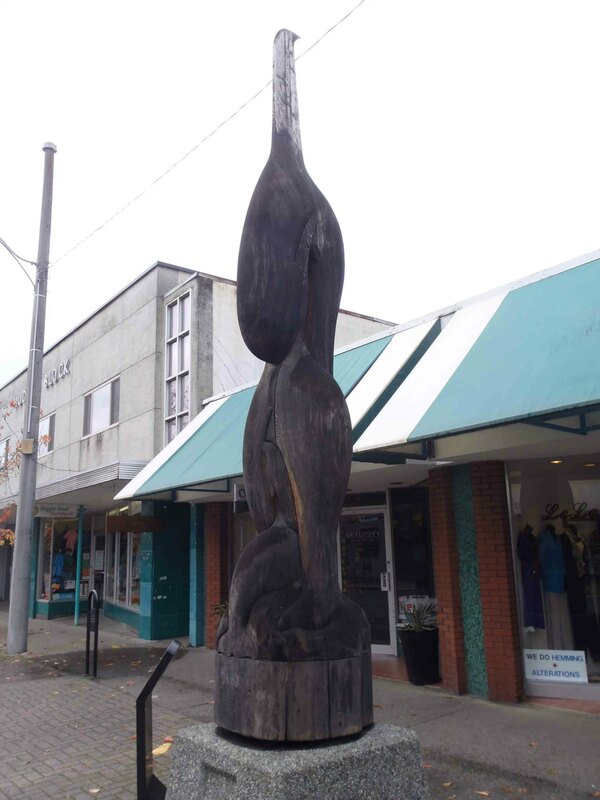 The Mother and Child sculpture is not a totem pole but it is considered part of the City of Duncan collection. Mother and Child sculpture, Craig Street, Duncan, B.C. 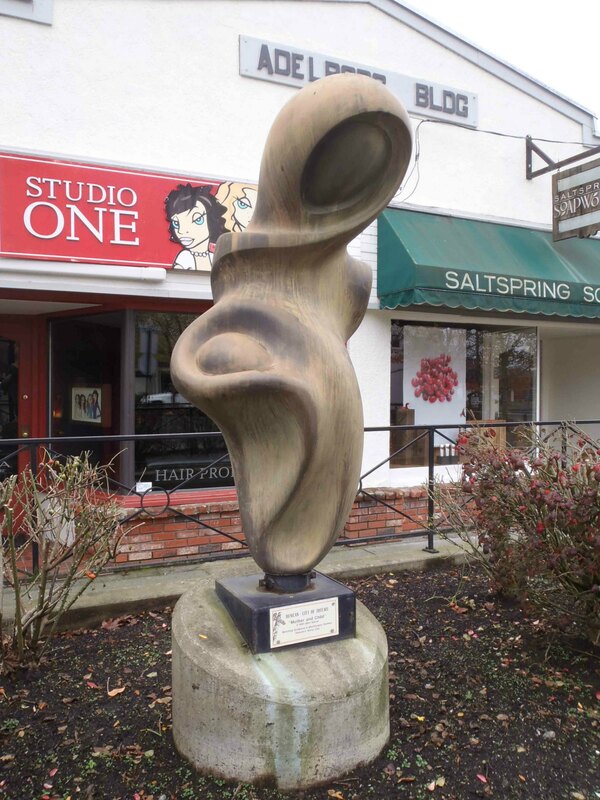 The Mother and Child sculpture was carved 1991 by Cowichan Valley artist Glen Spicer as part of an exchange with Duncan’s sister city of Montmagny, Quebec. There is an identical copy of Mother and Child displayed in Montmagny. Read More…. The next totem pole on the tour is Eagle Pole, which is located in Lois Lane near Canada Avenue. The Mother and Child sculpture faces Lois Lane, a pedestrian walkway which is located on the opposite side of City Square. You’ll see it if you look between between the City Square bandstand and the the Belongings store at 55 Lois Lane. Walk down Lois Lane and you’ll find the Eagle Pole, which is displayed in Lois Lane near Canada Avenue. Eagle Pole, Lois Lane, off Canada Avenue, Duncan, B.C. 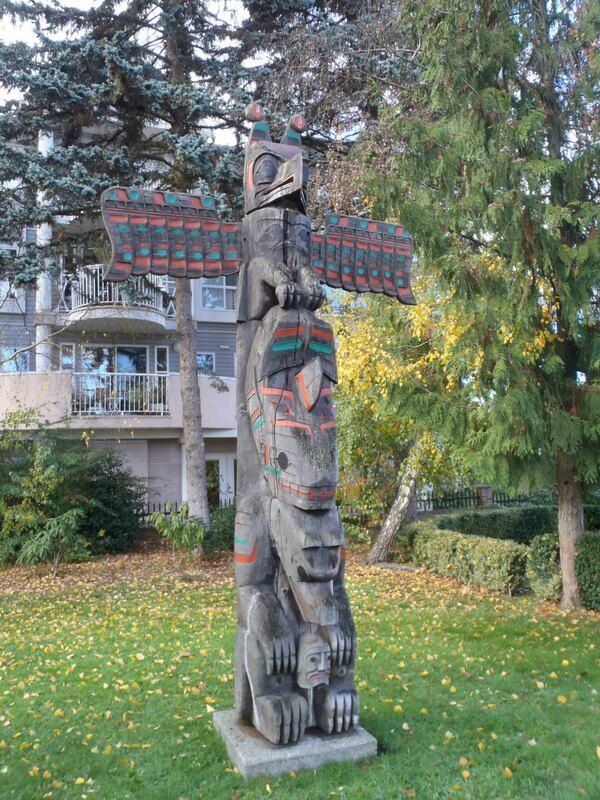 The Eagle Pole was the first totem pole carved for the City of Duncan collection. It was carved in 1986 by Francis Horne Sr. ……Read More…. From Eagle Pole, continue the tour by turning right on Canada Avenue and walking half a block to Kenneth Street. If you turn right on Kenneth Street for half a block, you will find PouPou Tane Hiira Pou Karanga, carved by New Zealand carver Tupari TeWhata. 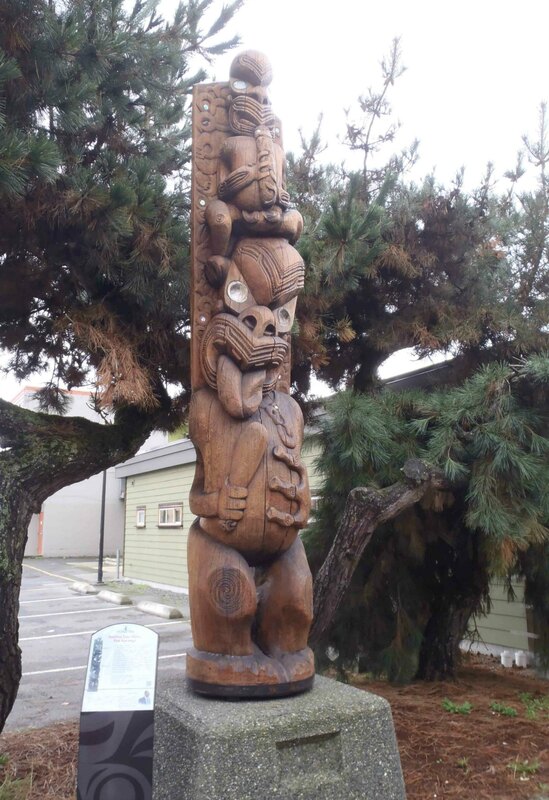 PouPou Tane Hiira Pou Karanga was carved in 1986 by New Zealand artist Tupari TeWhata and was presented to the City of Duncan by our sister city of Kaihoke, New Zealand….Read More…. From PouPou Tane Hiira Pou Karanga walk back to Canada Avenue and cross Canada Avenue at the Kenneth Street crosswalk. On the north side of the E&N Railway Station you’ll find the last display of totem poles on our Walking Tour. This display features four totem poles from the City of Duncan collection: Raven’s Gift, Pole of Wealth, Transformation and The Feast. Raven’s Gift, Pole of Wealth, Transformation, The Feast. Raven’s Gift totem pole, Canada Avenue, Duncan, B.C. 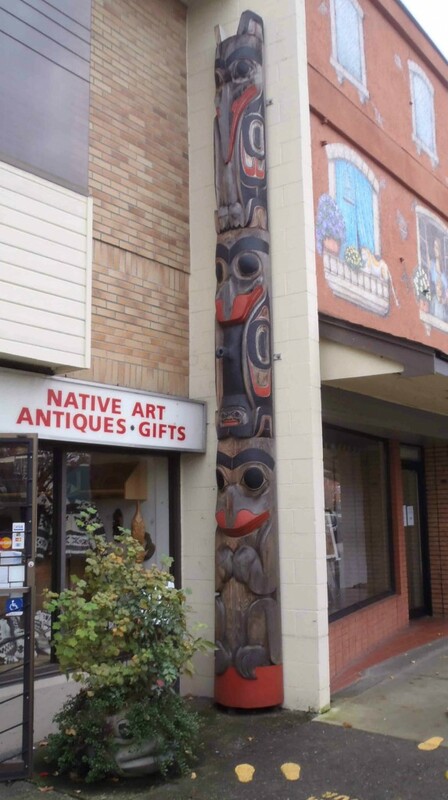 Raven’s Gift was carved in 1989 by Doug LaFortune…..Read More…. Pole of Wealth was carved in 1988 by master carver Simon Charlie, who has carved Simon Charlie‘s trademark technique of leaving textured surfaces on his animal figures in clearly visible on Pole of Wealth …..Read More….. Transformation was carved in 1987 by Corky Baines. Read More…. The Feast is currently undergoing restoration and has been removed from public display. The Feast was carved in 1987 by Doug LaFortune…Read More….